It’s tomato time, everyone! I just returned from a windy drive down country back roads to Lapsley Orchard where I was instantly greeted by bucketfuls of the colorful gems. Green, heirloom, small, large, I picked up the biggest one I could find and was overcome by the subtly sweet aroma. I excitedly took home a couple dozen. While I could easily enjoy the fruits with a light sprinkling of sea salt, I also enjoy creating new recipes each summer to showcase the beauties. Last year, it was an Heirloom Tomato Open Faced Sandwich with Feta Herb Butter, the year before, a Savory Tomato Crisp and the year before that, a Tomato Pie. This year, I assembled a BAT ('A' for arugula instead of lettuce) with a Southern twist. I baked homemade buttery biscuit sliders and layered tomatoes, spicy arugula, crispy bacon and a simple basil mayonnaise. I wrapped each slider in parchment to enjoy lakeside with some sweet tea. In a large bowl, whisk the flour, granulated sugar, baking powder, baking soda, and salt. Add the chilled butter and with a wooden spoon, gently mix until a large, messy lump is formed. Drizzle in the buttermilk and gently incorporate with the spoon. Transfer the dough to a floured surface and gently form into a more uniform shape. Gently pat down until the mixture is 3/4-inch thick. Using a small circle cutter (I used the rim of a small mason jar), press down into the dough all the way through to create a round and gently transfer the piece to a lined baking sheet. While this recipe usually forms larger biscuits, by using a small cutter, this recipe will form 12 biscuits. Before baking, brush each mound with a little melted butter and a sprinkling of salt. Bake until the biscuits are golden brown and fluffed up, about 14 minutes. In a small bowl, stir together the mayonnaise, fresh basil, salt and pepper and set aside. Once the biscuits cool slightly, begin assembling the BLTs. 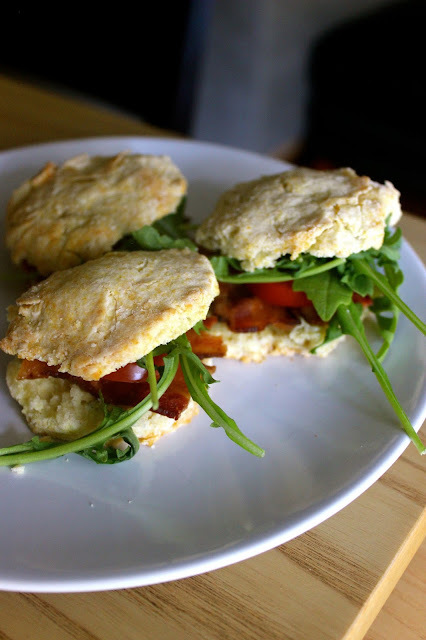 First, carefully slice each biscuit in half, then slather a layer of the basil mayo on each bottom half, top with two pieces of crispy bacon, a small handful of arugula, 2-3 tomato slices, and cover with the top halves.